The National Battlefields Commission has cancelled a re-enactment of the Battle of the Plains of Abraham set for Quebec City this summer due to security concerns that the mock battle could turn into a modern-day conflict. History buffs were to re-enact the Battle of the Plains of Abraham on the site of the battle this summer in Quebec City to commemorate the 250th anniversary of the British victory over the French. ((CBC)) The National Battlefields Commission has cancelled a re-enactment of the Battle of the Plains of Abraham set for Quebec City this summer due to security concerns that the mock battle could turn into a modern-day conflict. 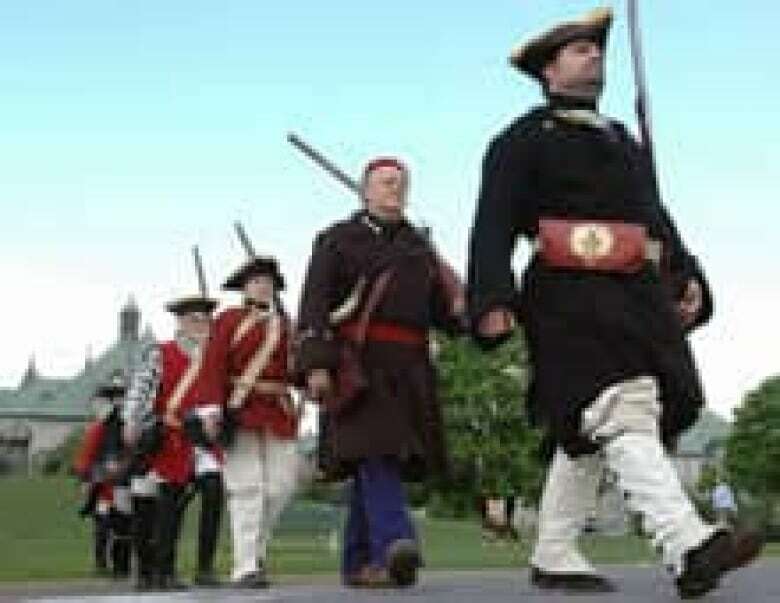 The federal body, which is responsible for the Plains site outside the fortified walls of Quebec City, announced Tuesday that a commemorative recreation of the 1759 battle is no longer welcome on the original battlefield site. "We cannot compromise the security of families and children that would attend the event," said André Juneau, head of the commission. The mock battle was supposed to be the highlight of a series of commemorative activities this summer in Quebec City to mark the 250th anniversary of the battle in which the British beat the French for control of what was then called New France. Over a four-day period in August, the "re-enactors," as they are called, were going to set up period-style camps and a marketplace for the public to visit. On the final day, 2,000 people in full costume and armed with replica weapons were to march onto the grassy field and re-enact the conquest of the British over the French. However, with growing controversy and threats of violence from some sovereigntists, the commission decided the site was no longer appropriate for the commemoration. The controversy began several weeks ago when leaders of the separatist Parti Québécois and Bloc Québécois began criticizing the event as a slap in the face for Quebecers of French ancestry. Sovereigntist groups launched petitions and internet campaigns. Some of the participants received threatening letters. Speaking in Montreal on Tuesday, federal Heritage Minister James Moore said he was disappointed the re-enactment would not proceed as planned. He blamed the Bloc and PQ for torpedoing the event just to gain political points. "The Bloc Québécois and those people who played politics with this event to the detriment of the city of Quebec, I think [they] have done a real disservice," Moore said. Moore pointed out that another re-enactment of the Battle of the Plains of Abraham was held 10 years ago under a PQ government, and no one made a fuss back then. Quebec sovereigntist groups reacted quickly to Tuesday's announcement, with representatives saying they were happy with the decision. However, Sylvain Rocheleau, a spokesperson for Le Réseau du résistance du Québécois, said he was not convinced by the reason given. "We were a bit surprised that they cancelled the event because of fear of violent acts," said Rocheleau. He said any threats of violence or confrontation came from a small minority of the overall movement against the re-enactment. "I think the commission wants us to believe they cancelled the event following threats from extremist movements," said Rocheleau. "[I think] they had to cancel the event because it was insulting a majority of francophones. They had to cancel it because it was a bad idea." Stéphane Tremblay of the Quebec Historical Corps said the cancellation was unfortunate, but the right move. "We understand the reasoning behind the cancellation and we fully support the National Battlefields Commission in its decision," said Tremblay. "The Quebec Historical Corps cannot in good conscience allow thousands of dedicated volunteers not to mention spectators and staff to potentially put themselves in harm's way by participating in an event which has been a subject of threats of disruption and even violence." The recreation of another battle of the period, the Battle of Sainte-Foy, has also been cancelled. Tremblay said his organization has made no decision about moving either re-enactment to new locations.